Care Funeral | Our service show we care… Our prices prove it! Care Funeral – Our service show we care… Our prices prove it! 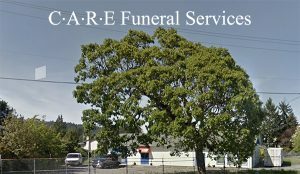 Funeral Service is a full service Funeral Provider in Greater Victoria, B.C. Canada, providing the very best value 24 hours a day to all faiths and beliefs on Vancouver Island. Family owned & operated… We have been helping families in Victoria through difficult times for over 25 years… and are still confidently recommended by healthcare professionals, clergy, and those we have served. We serve Duncan South including Mill Bay, Salt Spring Island, Galiano Island, Mayne Island, Pender Island, Saturna Island, Sidney, Saanich, Oak Bay, View Royal, Colwood, Langford, Metchosin, Sooke, Jordon River, Port Renfrew, and all points in between from our Victoria office at 934 Goldstream Ave, our Sidney office at 9787 4th Street, our Sooke office at 2016 Shields Road or your home. resources to help you deal with your loss. Our Service Says, “We Care.” Our Prices Prove It. Three Convenient Locations help us serve you better. Green Burial Services for over 25 years. Just fill out a quick form and we’ll send you the Funeral Planning Kit right away.